Radioisotopes of iodine have been incorporated into a wide variety of radiopharmaceuticals ranging from small, low molecular weight compounds to large molecules like antibodies. Because of the routine availability of radioisotopes of iodine with different nuclear decay properties, radioiodination is an attractive strategy because the same chemistry can be utilized for both radionuclide imaging and targeted radiotherapy. Over the years, various methods have been developed for the synthesis of radioiodinated compounds. This chapter gives an overview of these methods as well as their potential advantages and disadvantages. Some useful tips and tactics for the radioiodination chemistry are provided. 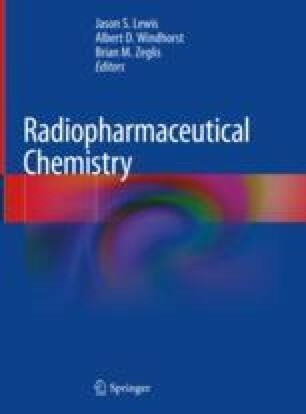 Important milestones in radioiodination chemistry are summarized and some thoughts about the future of radioiodination as a radiopharmaceutical chemistry strategy are provided. Carter RL, Johnson BF, Sood A, Rishel MJ, Valliant JF, Stephenson KA, et al. Biotin stannane for HPLC-free radioiodination. CA 28855223 A1. Google Patents 28 Mar 2013. https://www.google.com/patents/CA2866223A1?cl=en. Lee FT, Burvenich IJ, Guo N, Kocovski P, Tochon-Danguy H, Ackermann U, et al. l-tyrosine confers residualizing properties to a d-amino acid-rich residualizing peptide for radioiodination of internalizing antibodies. Mol Imaging. 2016. https://doi.org/10.1177/15:1536012116647535.